Why eat out at a Chinese restaurant when you can try these easy step by step Chinese food recipes at the comfort of your own home. Enjoy these tasty Chinese food recipes! Nowadays Chinese food is enjoying high reputation in the world due to its delicious taste and charming appearance. Chinese food is certainly the world's most popular cuisine. All Chinese people think that delicious and nutritious food is a basic necessity of life. 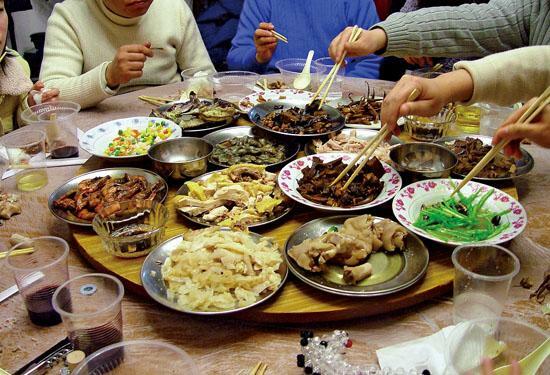 In most dishes in Chinese cooking, food is prepared in bite sized pieces, ready for picking up and eating. Chinese culture do not use knives and forks due to fact that these instruments are regarded as weapons, hence why chopsticks are commonly used. Authentic Chinese food is probably the healthiest food in the world. 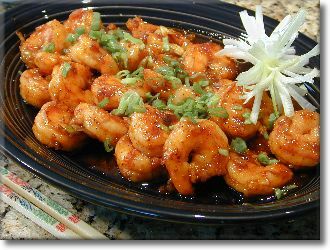 This website provides some tasty and healthy Chinese food recipes with no MSG that are commonly used in Chinese restaurants. Some restaurants that are not authentic, prepare their menu with highly saturated fats or with meats that contain unhealthy amounts of animal fat. These “Chinese” restaurants are not recommended and they are both neither authentic nor healthy. If you are unsure if a Chinese restaurant is authentic, check to see if there are lots of Chinese people eating inside. If there are lots of Chinese people it is highly likely the restaurant serves “authentic” Chinese food. What makes Chinese cooking "Chinese Cooking"? Chinese Cooking Recipes are often hand picked from a variety of sources to suit the western culture and requirements. The Chinese recipes are simple, healthy and delicious. 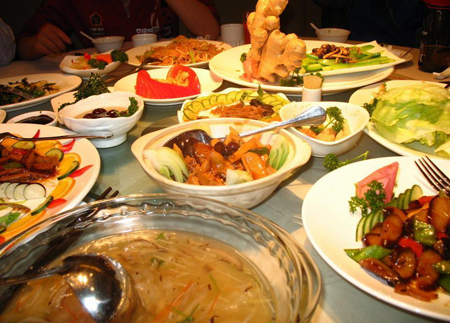 Today, Chinese cuisines have steadily moved out from the restaurants into home kitchens. The best thing about Chinese cooking is that the mouth watering, simple and straight forward recipes are cooked in less time. Chinese people use common ingredients such as meats, poultry, fish and vegetables known to the Western palate but also include some exotic ingredients such as chicken feet, sharks fin, etc… Chinese cooking is famous for its different types of cooking techniques. Among the techniques, stir-frying is the most popular and very common technique. Other Chinese food cooking techniques include steaming, stewing, deep-frying, braising and many more. In stir-frying, two things are very important, the oil temperature and the cooking speed of the recipe. The food is always in a motion. In steaming technique, food is cooked by the steam activity. The meat dishes are usually prepared by a steaming technique. Chinese Cooking Recipes are often cooked with water or oil. The real fact of these exotic and fancy Chinese cooking dishes is that, they require much more than just oil and water. The recipes have become very popular in every restaurant as many food lovers around the world are developing a special liking for Chinese food. Cooking a recipe is not just about adding salt or spices and preparing a dish. It is a way to make impressive meals that are quite healthy and nutritional as well. It is about mixing the right ingredients along with the food items, to suit the taste of people around the world. Chinese cooking recipes and Chinese cuisine also have different styles based on geographic regions. Some styles include as Peking cuisine, Cantonese cuisine, Shanghai style and the most popular one spicy Szechwan cooking. This website contains several of these Chinese food cooking styles so be sure to try the difference! who are not accustomed to Chinese Food Terms. Chow Mein: Noodles deep fried in a wok. Cantonese: Cantonese cooking includes a variety of dishes, rich in meat and seafood. Stir Fry: A method of Chinese cooking where ingredients are stirred around in a very hot pan with a light coating of oil. In a bowl, stir together water, ketchup, soy sauce, cornstarch, honey, crushed red pepper, and ground ginger. Set aside. Heat oil in a large skillet over medium-high heat. Stir in green onions and garlic; cook 30 seconds. 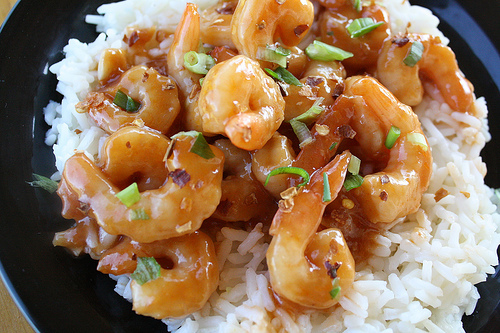 Stir in shrimp, and toss to coat with oil. Stir in sauce. Cook and stir until sauce is bubbly and thickened. Chinese-FoodRecipes.net Copyright © 2013 - Your no.1 source of Chinese Food Recipes!. Powered by Blogger.